Smokey, a 12-year-old cat from the UK, made world-wide news in March when she was submitted to Guinness as a candidate for the loudest cat in the world. Reports claimed her purring reached 73 dB (16 times louder than a normal cat). She was recorded by a music expert from Northampton College and the recording was witnessed by four individuals with various backgrounds. 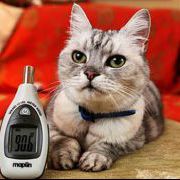 On 5 May, Guinness announced that Smokey was the loudest domestic cat in the world, at 67.7 dB (LA peak). Smokey and I are very excited at being awarded the Guinness World Records title for the Loudest purring domestic cat. We originally started a purring competition in our home town of Northampton to promote the cats charity 'Cats Protection'. We wish to thank all those who have supported Smokey with her record attempt and especially wish to thank Northampton College for organising the trials and supplying the expertise I needed to comply with the technical aspects of a Guinness World Records Claim. We are very happy and purring loudly at the announcement that we hold a Guinness World Records title. It's amazing; My mum had a cat that looked and sounded just like Smokey, and (probably the weirdest thing was) he was named Smokey. When they were first showing this on the news, she only heard the vocalization and said, "That sounds like my Smokey!" Granted, her Smokey has been dead for many years now. . . I think that I said the name "Smokey" too many times in that post.